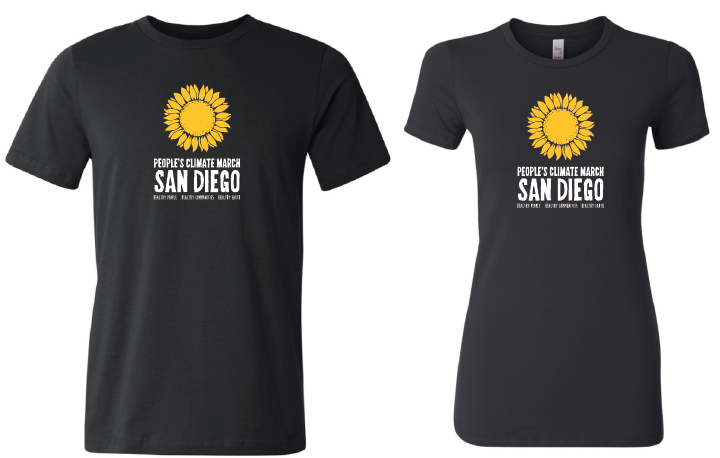 Order a People's Climate March or SanDiego350 T-shirt! 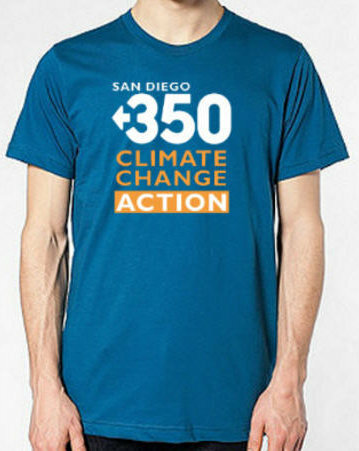 By popular request we will continue to offer People's Climate March and SanDiego350 t-shirts for a limited time. We ran out of all our shirts early on Saturday, April 29, but will order more ASAP. We need your T-shirt order no later than Monday night, May 8, 2017. Shirts should be available for pickup at one of these upcoming events (we're waiting to get confirmation). Both of these events take place at First Unitarian Universalist Church, 4190 Front Street, San Diego, CA 92103. We will also arrange a separate pick up point for folks in North County TBA soon. All profits and donations support the People's Climate March and grassroots climate advocacy and organizing in San Diego. Email us if you need to make separate arrangements. Note: the women's sizes for the PCM shirt run quite small, e.g., if you're normally a medium you probably should order at least a L or maybe an XL. US made black cotton t-shirts with a yellow sunflower and white text. Men's and women's sizes available. US made organic cotton royal blue t-shirts with the SanDiego350 logo. Unisex sizes. Together we are powerful and can advance climate solutions. Thank you! Questions on ordering a t-shirt? Contact us.